The anticipation and advent of QE3 has filled the precious metals market champions with considerable optimism. Gold and silver have both steadily, but firmly moved to higher ground. Taking a quick look at the chart we can glean a few simple trend changes. The first one is that silver’s downtrend that has been evident for the last 15 months or so, has been well and truly broken with silver rallying from around $26.00 to close today at $34.95. We would also draw your attention to the 50dma which is in the process of swinging through the 200dma in an upward movement, thus forming what is commonly known as a golden crossover. This recent rally and the golden crossover suggests that silver prices are going higher and are usually positive for silver. 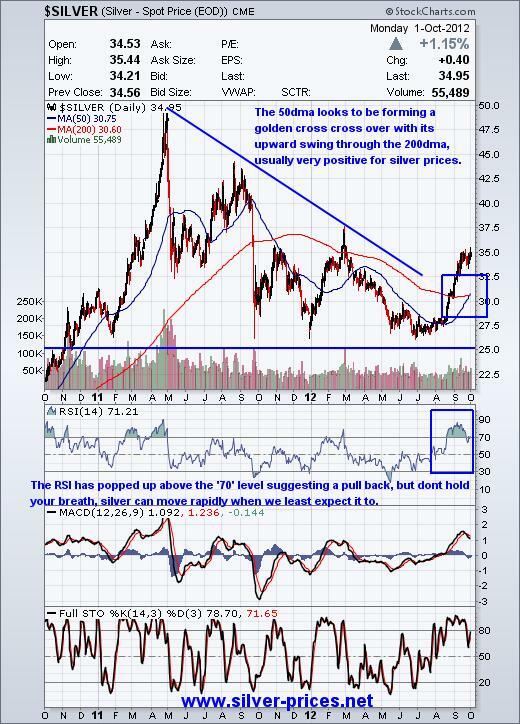 The canary in the coal mine is however, the position of the technical indicators, which suggest that silver is now overbought and as such should experience a pull back or at least a short period of consolidation. The RSI, MACD and the STO look to have peaked and are now heading south. Overall we expect silver prices to continue in this multi-year bull market for precious metals and to set new all-time highs in the near to medium term. A $50.00 price tag before the end of the year is a real stretch; however, it is not impossible. The easing of monetary policy is now the order of day for the major nations who are faced with rising unemployment and stagnating economies. We see stagnation as a real problem going forward, without economic activity and growth, the tax receipts will be a lot lower than governments are anticipating and a fall in revenue is something that will give them nightmares. Should this period of stagnation persist and if the inflation monster was to raise its ugly head, then we would have to endure a period of stagflation which is really the worst of both worlds. We would also draw your attention to another negative in that the overall sentiment would appear to be flat, as the general public remains disinterested and oblivious to the on-going debasement of their currency. This lack of interest is understandable as the same public is pre-occupied with a myriad of other issues that are far closer to home. Employment and future job prospects take center stage, followed by rising food and gasoline costs. In the long term this is bullish for silver as when the public at large realize just what is going on they will move on mass into the precious metals sector causing an enormous bubble. A similar thing happened back in the eighties when silver and gold entered into the mania phase of the bull market. Will it be different this time you ask? Oh yes it will. There are many more market participants now than there was then so the upward pressure on prices will many times greater and prices will go through the ceiling. Just to re-cap, on July 5th 2012, we penned an article entitled: ‘The Next Time Silver Crosses $30.00 will be the Last Time’ on that day silver was languishing at $27.67 as the summer doldrums offered little in the way of positive action. So, with silver prices now trading above $30.00 we have our necks well and truly on the chopping block. A lot can happen to take silver back down again and I guess our biggest worry would be interference from the regulators in that they can alter the margin requirements. This would cause some of the speculators to dispose of some of their holdings and thus put downward pressure on silver prices. If this were to occur we can only hope that the selling would be short lived and normal service would be resumed, as they say. In the July article we also wrote the following; to conclude we politely suggest that you accumulate as and when you can and that you do not sell any of your physical silver bars or coins, you might be just offering someone else a real bargain. We hope that you did manage to ignore the naysayers and that you continued to buy throughout the summer. We are quietly confident the silver prices are headed are much, much higher and that we will all be rewarded for patiently accumulating physical silver. Having recognized that the stocks were underperforming the metals, we switched our focus to trading options in order to get some leverage to the gyrations in the precious metals sector. This is not a strategy for the fainthearted, neither is it to be feared if you adopt a disciplined and conservative approach to each trade. The old adage still applies here that you should never fall in love with a trade, no matter how confident you are of it being a rip roaring success. Stay positive, think precious metals, and avoid the folding stuff. So if we have stimulated your interest then please feel free to add your comments as they help to stimulate and widen the debate, thanks. © 2012 Kitco Metals Inc.